Wall Street analysts would like incoming Coca-Cola CEO James Quincey to complete a huge acquisition next year. Why this idea isn't sound, and what Coca-Cola should focus on instead. As we look forward to the new year, The Coca-Cola Company (NYSE:KO) finds itself in the midst of a number of important transformations. Its drive to refranchise nearly all of its North American bottling operations by the end of 2017 appears to be on track. This initiative will leave Coca-Cola as an asset-light business focused on concentrates and the marketing of its 500-plus global brands. And in May of next year, Chief Operating Officer James Quincey will succeed Muhtar Kent as CEO, with Kent continuing as Chairman of the company's board of directors. Image source: Coca-Cola Instagram page. Quincey will undoubtedly find himself under immediate pressure to continue to build Coca-Cola's long-term value while advancing its stock price, which is heading to a flat finish in 2016 on a total-return basis. He'll attempt these improvements even as the company struggles to perform under weaker sweetened carbonated-beverage sales. Is there a shortcut available to boosting both the company's value and the "KO" ticker? Recently, the possibility that the incoming Trump administration may allow U.S. corporations to repatriate cash held in foreign countries at a temporarily reduced tax rate has led some analysts to speculate on a potentially large deal that Quincey, no stranger to mergers and acquisitions, could effect as early as next year. Coca-Cola very visibly invested a cool $2.15 billion in Monster Beverage Corporation (NASDAQ:MNST) in 2015, becoming Monster's preferred global distribution partner in the process. Analysts at Evercore ISI have recently speculated that, under a foreign cash leniency window, Coca-Cola could bring home $20 billion in overseas funds, enabling the company to acquire the portion of Monster it doesn't own. Analysts at Cowen & Company have also advocated for Coca-Cola to take this step. Currently, Coca-Cola holds close to a 17% stake in the energy-beverage leader. Monster's market capitalization stands at $26 billion; thus, Coke would need about $21.5 billion to complete a takeover. While, like many deals, this sounds good on paper, shareholders shouldn't get excited too quickly, as the transaction is unlikely to happen in 2017. First, the potentially repatriable $20 billion represents most of Coca-Cola's $25.5 billion in cash and marketable securities on its balance sheet. Further, Coca-Cola's working capital, of which the $25.5 billion is a component, is just $10.1 billion. Working capital, the difference between current assets and current liabilities, is used to fund daily operations. To express this in a more tangible way, a decent portion of the $20 billion held in foreign accounts isn't sitting idle, collecting interest. Rather, the company's present working capital implies that at least half of that amount, and perhaps more, is being used in the course of Coca-Cola's normal sales-to-cash conversion business cycle outside of North America. For Coca-Cola, then, the foreign cash isn't "ready money," and even if roughly $10 billion can be thought of as free and clear, it's unlikely that the company wants to tap out its borrowing capacity for another $11.5 billion to acquire a dominant player in a single, if lucrative, slice of the beverage market (i.e. energy drinks). This is because Coca-Cola has ramped up borrowings tremendously since the beginning of 2015 in order to fund smaller acquisitions and shareholder-friendly actions such as share repurchases. In just seven business quarters, the company has increased its total debt more than 56%, to $35.1 billion. In doing so, it's turned its debt-to-equity ratio upside down, from a high, if acceptable, level of 0.74 at the outset of 2015 to a rather uncomfortable ratio of 1.33 as of the company's most recent quarter, which ended on September 30th, 2016. If money wasn't an issue, the idea of acquiring Monster outright would be a sensible one. As a company that develops and markets drinks while outsourcing manufacturing and distribution to third parties, Monster already employs the asset-light operations structure that Coca-Cola is moving toward. Because of this financial model, Monster enjoys even higher operating margins than Coke -- though that advantage is likely to disappear once the Atlanta-based beverage behemoth completes its refranchising initiative in 2017. KO EV-to-EBITDA (TTM) data by YCharts. Typically, it's a good idea to for an acquirer to buy a target company with a lower EV-to-EBITDA multiple, where possible. Purchasing the rest of Monster, while probably achievable if Coke really decides to stretch its resources, won't be a cheap exercise. 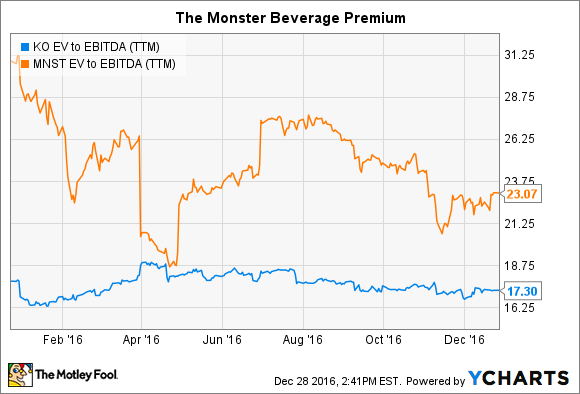 If snapping up the remaining publicly traded shares of Monster Beverage Corporation isn't the most advisable use of Coca-Cola's resources in 2017, what should the company do to heighten its value? In addition to completing its bottling divestments on time this coming year, Coca-Cola should focus on ramping up internal innovation. An example that you or I might not immediately identify as innovation, but counts for the same in the beverage industry, is Coca-Cola's race to reduce sugar in its carbonated beverages. On October 17th of this year, rival PepsiCo (NASDAQ:PEP) announced that, by 2025, two-thirds of its global beverage volume will contain less than 100 calories or fewer from added sugar, as measured by a 12-oz. serving. Days later, COO Quincey noted to analysts on Coca-Cola's Q3 2017 earnings call that the company itself has over 200 sugar reformulation initiatives underway. The reformulations point to Coca-Cola's deep ability to evolve its product portfolio. Other examples include new-use cases for brand Coke, including test introductions of "Coca-Cola Lime" in Romania and "Coca-Cola Ginger" in Australia. Coca-Cola's numerous acquisitions of small brands, which it intends to scale through its massive distribution system to offset soda volume declines, have grabbed more attention from the press and investors as of late. The purchase this summer of Unilever's (NYSE:UL) soy-based beverage business, known as AdeS, with the help of partner Coca-Cola FEMSA (NYSE:KOF), illustrates the type of portfolio diversification most shareholders are familiar with. Yet ultimately, if Coca-Cola is lowering its own capital requirements by divesting manufacturing operations, it follows that the highest return on future investable cash flows may come from the organization's annual research-and-development spend. In addition to buying up other brands, Coca-Cola should seek to develop its own new formulations to expand through its distribution system. That's the type of economic muscle that, if exercised vigorously, negates the need to take "big-bet" risks on peers like Monster Beverage Corporation.